University of Delaware alumnus Roger Craig will compete in the "Jeopardy! Battle of the Decades" tournament two-day finals on Thursday and Friday. 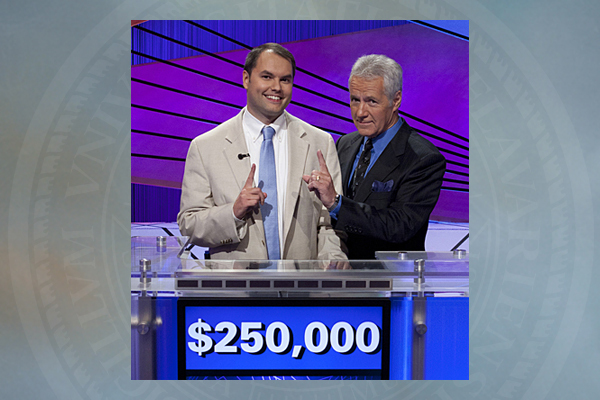 8:48 a.m., May 14, 2014--University of Delaware alumnus Roger Craig will compete in the two-day Jeopardy! Battle of the Decades tournament finals to air Thursday and Friday, May 15 and 16. Craig, who has a master’s degree and doctorate in computer and information sciences from UD, defeated Colby Burnett and Pam Mueller in a semifinal round that aired Wednesday. In the finals, Craig will face Ken Jennings and Brad Rutter. To date, Craig has total career winnings of $497,801 on the popular game show. Craig set a one-day winnings record in 2010 and ended that run with what was then the third highest total in Jeopardy! history. The next year, he won the prestigious Jeopardy! Tournament of Champions.